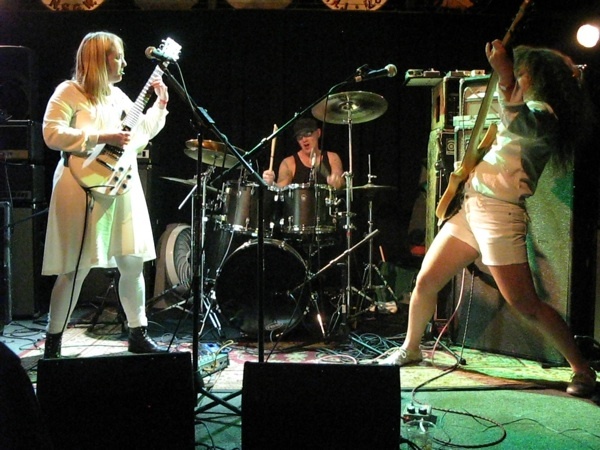 Known for her work as a guitarist in SubArachnoid Space, a San Francisco-based heavy rock band that existed for 15 years between 1996 and 2011 and released 10 studio albums in the process, Portland-based musician Melynda Jackson has now formed her new band Eight Bells, named after SAS’ final studio album. Through this new outlet, Melynda gives us a different interpretation of a similar kind of experimental heavy rock, both with her guitar playing and unique vocal style. 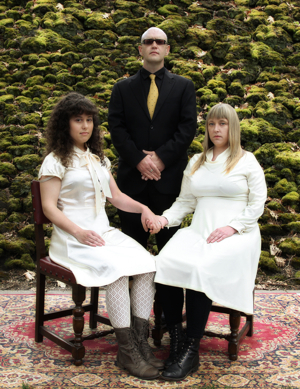 Joining her in this conquest are Chris Van Huffel on drums and Haley Westeiner on bass and vocals. 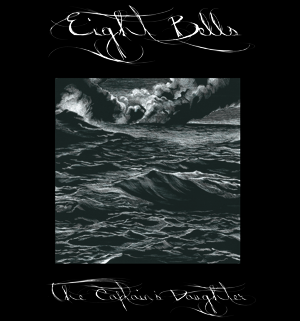 Eight Bells’ debut album ‘The Captain’s Daughter’ came out in February via Seventh Rule Recordings, and having heard it I can safely say that the 4-track, 31-minute effort nails what Melynda is attempting to accomplish, in its own dark, intriguing way. To talk more in detail about the band, I spoke to her in detail recently. Check out part 1 of our conversation below. Part 2 will be posted on GuitarWorld.com soon. First of all, how did you form the idea for this band? I didn’t want to stop playing music, and I had put a lot of time in the previous band and the drummer that I played with for the longest time in SubArachnoid Space, he sort of turned up in my life again. He was away for a while. When I moved to Portland he stayed in San Francisco and I didn’t see him for a good three years or so. And then he moved up here and I knew I wanted to play with him, so we decided we were going to play together, and then we found Haley. That’s pretty much how it worked out. Would you say this music is more about the actual emotion and expression as compared to what you did previously? Well, you know, those bands were really about emotional expression too, but I just think that may be with Eight Bells I found a more streamlined way to do it and convey that emotion, at least for me and regarding my playing. I feel that I can be little more clear now, as clear as something like emotion could be. Having said that, I think the music is still heavy, and is definitely heavier than what people would describe as ‘psychedelic’ or ‘post-rock’. Those terms have negative impressions at times. Some people want to get away from music that’s associated with those terms. Do you think you’ve escaped from that categorization with this band? That was part of the goal. I specifically never choose psychedelia to be exactly what SubArachnoid Space was either, and that band always had a bit of heavy rock and metal following anyway. But yeah, I’d like to separate myself a little bit from that terminology. I kind of don’t care that much about what people think, but I do know that psychedelia as a genre, sort of like a buzz-word just got overused for a bit, and I don’t really want to associate with post-rock too heavily either because to me that’s just a bit more predictable than what I want to do with Eight Bells. But even though I’d like to separate myself from these two terms, still it’s kind of in my style. I use a lot of effects, so people will say that it’s psychedelic. It’s OK if someone says that the music has a psychedelic attribute, but it’s not a psychedelic band per se. It’s definitely not the String Cheese Incident. As you said, SAS has a heavy rock and metal following. Would it be somewhat similar for Eight Bells too, you think? Yeah, I do! It’s a really similar group of people. I think that it’s certainly not going to be an indie rock following (laughs). I don’t know what kind of people we’ll appeal to, but I’m definitely against having it only for an exclusive group of people. Everybody is allowed and welcome to like and support Eight Bells’ music! But I think it’s a little bit cerebral also. There’s always going to be the acid trippers of the world enjoying it and then it might be a little too dark for some folks. But most of our shows we play tend to be with heavier bands. So, it’s loud (laughs), and we use some power chords. How are the other two members of the band contributing in the whole process surrounding Eight Bells’ music? Well, Haley takes a pretty big role in helping to write songs. For this first album, there was material that I already had. The one song on there that’s the most even in terms of all of us working together is ‘Fate And Technology’. Haley and I sat down together from group rehearsals and practiced singing parts to come up with arrangements and what not. Chris is kind of an on-the-spot arranger. Usually we start off with a pretty broad and undefined group of riffs and we play them until we can mix them together in different ways. Then we go about trying to record them really archaically (laughs), and then we figure out how to arrange the song. There are other songs that just sort of write themselves. What plans do you have? Do you have any shows coming up or is it just writing mode for now? Well, we have a West Coast tour coming up that’ll take us up to Vancouver and then down as far as the Bay Area. So we’re going to do that and when we’re done, I think we’re going to just flush out the songs that we’ve started to write, and write more. I’d really like to be recording again, probably by late summer, hopefully. I read in your bio that you grew up in Texas. Lately, I’ve been noticing a lot of heavy rock and metal bands based out of Texas. Was there something specifically about Texas that inspired you to be a musician? Well, Texas is as different as it can get depending on what part of it you’re in. I grew up in the middle of nowhere, so I really didn’t have a lot of choices beyond terrestrial radio while growing up. There was no alternative music, really, beyond what I could hear on the radio. There also wasn’t anything to do (laughs). So I listened to a lot of radio. I never really identified with a punk group of a sub-culture, because there wasn’t any. When I got older, in my late teens and early twenties I started seeing bands like Ed Hall. There were a lot of really heavy Texas bands around Austin and Dallas that were pretty aggressive but also strange. May be that affected me. Also, Texas’ weather is really extreme. Nature is really extreme. There are things that can bite you and kill you (laughs). It gets really hot or really cold there. It’s not the most forgiving terrain, and it can feel pretty barren. Where I grew up it was all about rolling hills, flat areas and plateaus. Not quite deserty, but there were no trees. There were big open expanses that were desolate. I was really influenced by all that.